Home / Curious George / Giveaway / Liberty Science Center / Review / Reviews / Travel / Let's Get Curious With Curious George and a Giveaway! Let's Get Curious With Curious George and a Giveaway! Disclosure: This is not a compensated post. I was invited to attend this event with my family and given 4 tickets to host a giveaway. All words and opinions are 100% my own. If you guys remember a few months ago we headed down to Liberty Science Center to check out the TMNT exhibit, well last weekend we were lucky enough to check out the newest exhibit at LSC. The Let's get Curious with Curious George, perfect for all your little explorers. You know it's always a fun day when you get to take the ferry down to NJ. Children will love getting to explore the world of Curious George. There are plenty of fun activities to keep them busy for hours, they will not want to leave. The exhibits all consist of the children problem solving while having fun. Kids will love playing mini golf with their little mischievous friend Curious George. Mini golf sticks and golf balls perfect for little hands. Building fun that teaches them that there is no wrong or right way as long a you keep on trying. Children can also go grocery shopping in the little Sidewalk Produce stand located in the exhibit. There they can learn how to weigh their fruits and vegetable, sort them and even check out with a play cash register. Learning how to count and all about numbers all while having fun is always a great way to learn. 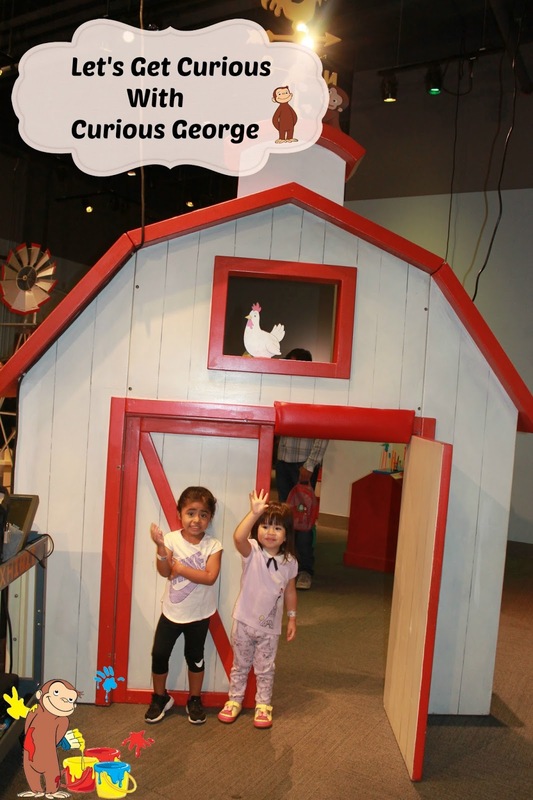 Grown ups can also have fun, they will love learning more about the history behind Curious George and some more fun facts that are located all around the exhibit. They will also love hanging out with Curious George himself while they watch the little ones play. Make sure to stop by LSC and checkout the Curious George: Let's Get Curious Exhibit before it's too late. And just incase you want to meet Curious himself make sure to stop by October 1, November 11, November 25, December 28 and December 29 when George will be there himself. Make sure to check out the Liberty Science Center Website for exact times. Giveaway begins today and ends October 2nd. 6 comments on "Let's Get Curious With Curious George and a Giveaway!" I would take my family! Quality time at the LSC would be awesome!! My son is the same age and he would love this! His 1st movie was the curious george movie this past summer at the theater. Fun exhibit! This looks like a great family placebto visit. I would definitely take my kids. Cute giveaway! I don't have any children yet but this definitely looks great for those parents with cute little kiddos just like yours! What a fun day with your kids! I can't wait until my little girl is old enough to go to things like this!